In July of 2019, Acadia University plans to launch the first junior math and computer science camp in Nova Scotia. This is an opportunity for young students in the Annapolis Valley to participate in a week of fun and enriching science-based activities, and develop their curiosity and enjoyment of math and computer science. 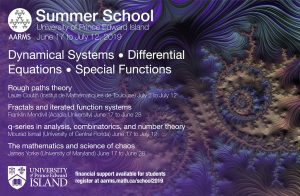 The Atlantic Association for Research in the Mathematical Sciences (AARMS) will host its second Industrial Problem Solving Workshop (IPSW) from July 15 to 19 at the University of New Brunswick. At this event, representatives from companies and non-profits from Atlantic Canada and elsewhere will present academically interesting and industrial relevant problems to graduate students and faculty mentors. The mentors and students work intensively on the problems for a few days and then present their solutions back to the industrial representatives. Fields Institute, 222 College St.